We are a business located in Canada, and though, we were unable to order it to Canada through the website, we were able to contact them via email and have that done. They replied quickly and the shipment came in within a week. The mixing and application of the white whiteboard paint was easy enough, with the directions provided. We have placed multiple orders. Thank you for the great product and service! 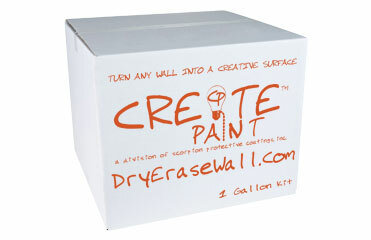 BEST VALUE ONLINE FOR WHITE ERASE PAINT! If you are looking for the best value, look no further. I did an extensive search for white erase paint online and found 3 or 4 places to purchase. Some of them were way more expensive and had fun videos but I didn’t care about any of that. I needed to cover more wall space and I wanted a quality product. Even after all the discounts at the other places, create paint was way less expensive and I got twice the amount of product as I would have had I purchased else where. It was easy to paint on the walls and it covered exactly the amount of space they said it would. We did put two coats on which i thought was super important. There was no smell the next day. We have had it on for over a month now and it ROCKS! We have had no ghosting issues with marker having been on the paint for over two weeks when we erase it. Save yourself some time and buy here with confidence. Blake was helpful and personally guaranteed the quality! Introducing The First Dry Erase Bed Liner! When you look at the "whiteboard" paint market there are a few products out there and they are not the easiest to use and are quite expensive. We know. We have used them ourselves. But when we stumbled upon this formulation we knew this would be a great solution to both problems. Create paint is easy to use and very affordable. We love to hear from our customers. Let us know what you created. © 2014 Scorpion Protective Coatings, Inc.